MCs from the event are hosting a game. The object was to come up and guess the weight of the Kei-Car transmission, which if you can't guess, is the black item at their feet. 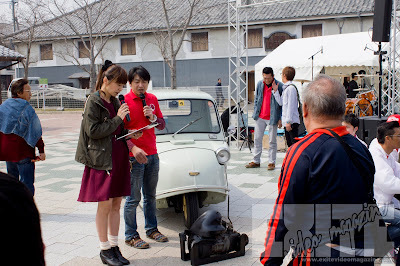 Kei-cars are Japan's economical choice for getting around. They are small, and use a 660cc engine. They get great gas mileage, and the parts are a lot cheaper for these cars. Taxes and bi-yearly "shaken," or MOT or safety inspections, are muuuuch cheaper than for their full sized counterparts. The trade off is that most Kei-cars produce a road scorching 68HP... a little more if they are turbo charged.